Apparently I travel to Richmond every October, and around the same weekend. Huh. Most years it’s to meet up with my mother who flies in for the folk festival every year, but this time, I decided to whisk G away for a break from the house for a much needed break. Which sortof worked and sortof didn’t. Other than our bodies deciding to get a bit of a cold or some really bad allergies, we did have a nice time eating awesome vegan eats, catching up with some of my family members, getting much needed clothes shopping done (oh how I miss living in a town with a real mall! ), and riding roller coasters at King’s Dominion. After eating at Boylan Heights on the way (I seriously can’t help it–it’s my new favorite addiction), we hit town a bit past rush hour, and after checking into our hotel, we decided to head across the river to Legend Brewing Company for some beers and a nibble to eat. 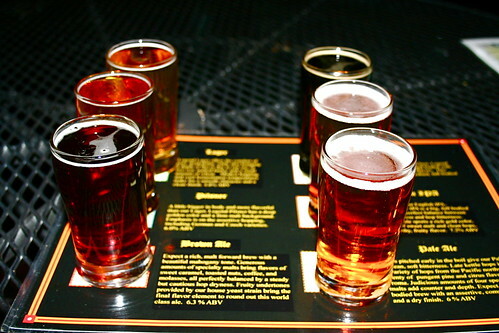 While I normally get a pint of whatever is seasonal, we decided to start by splitting a flight of their six mainstays–Lager, Porter, Brown Ale, Golden IPA, Pilsner, and Pale Ale. Their pours were generous. (smile) I’m personally a fan of the Porter & Brown Ale out of that mix, but if you’re into hops, definitely try the IPA. While Legend isn’t my favorite brewery, it is a great local Virginia one with solid, always good beers. And for a bit more creativity, check out the seasonal selections–the Oktoberfest is quite tasty. 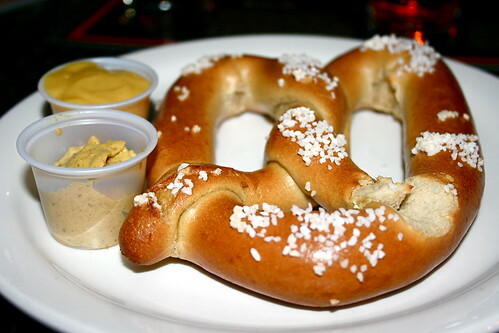 To pair with the beer, we split one of their golden, chewy soft pretzels which came with heidelberg and honey mustard. Ick on the honey mustard, but, dipped in the heidelberg, quite delish. Nothing too special about it–just a hot, soft, salty, perfect pretzel, but isn’t that enough sometimes? I was really disheartened by the menu changes, however. Over the past several years I’ve really enjoyed the black bean burger and the portobello mushroom sandwich–both of which are no longer on the menu. My uncle claims that by downsizing the menu the quality of all their dishes has increased, but, for a vegetarian or vegan, there are almost no options beyond a pretzel or a salad. And that makes me less likely to return for a meal any time soon. Sad hat. I hope that they add more veg options in the future, especially since the ones they had were so spot on. 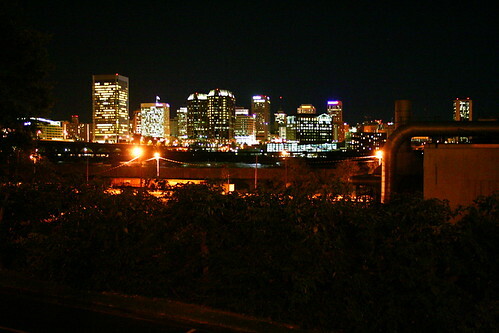 But, for a great place to grab a beer or two and some snacks on a patio overlooking the James River and downtown Richmond, you can’t beat it. Just stopping by to pass on an award, you can check it out at my latest post for the details. Thanks for all of your lovely comments on my blog, I’m looking forward to trying your enchiladas soon! What a shame that the vegan options have disappeared, both the black bean burger and portobello sandwich sound fantastic and the sort of food I’d love to be able to order when eating out. Mmm, a fluffy soft pretzel with plenty of coarse salt… I can’t remember the last time I had one! It does sound like the perfect accompaniment to beer though. I really should try making them from scratch one of these days.